In the first in a new series on VanderbiltCupRaces.com, Gary Hammond documents Bell & Post of Farmingdale. 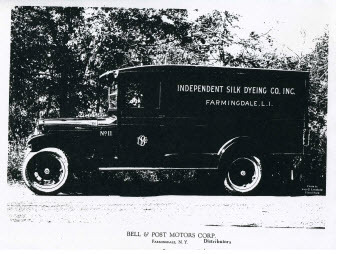 According to the New York State Department of State, the Bell & Post Motors Corporation Certificate of Incorporation was filed with them on October 26, 1925. The Corporation was dissolved by Proclamation on December 15, 1937. The "Post" of Bell & Post refers to Harry Lowerre Post (1881-1956), a lifelong resident of Farmingdale, L.I., N.Y. He lived at 393 Main St., Farmingdale, with his wife Charlotte Kraft Post (c.1882-1958), and daughter Gladys Kraft Post (1907-1989). Harry grew up in Farmingdale, going to school there, and following his lifelong trade of woodworker. In addition, his WWI Draft Registration Card, dated Sept. 12, 1918, not only gives his occupation as Motor Truck Bodies Mfgr, but gives us a description of him being of medium height and build, and having blue eyes and brown hair. The Post house no longer exists; it was demolished after Gladys death, and now is a parking lot for the McCourt & Trudden Funeral Home, which stands just north of the former house site. As stated in Central Long Island and Its Attractions, published by George W. Richardson, N.Y., , “H. L. Post, Sash, Blinds, Doors, Parkway Ave….started in business 10 years ago on Main St. on a small scale and in March  moved to his present fine new structure measuring 30x70, 2 stories besides 3 small additions, covering 2,500 sq. 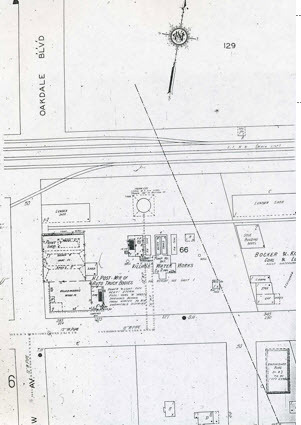 feet.” The factory stood on the northeast corner of Eastern Parkway and Oakview Ave., east of the Farmingdale LIRR Station. It later would be used by Max Staller’s Montauk Wholesale Grocery Co. as its wholesale fruit and produce warehouse. During the last quarter of the 20th century, J. Leopold & Sons, Inc. (also wholesale produce) occupied the building. Max Staller is the same Max Staller whose Mansion latter became the original Nassau County Historical Museum in Salisbury/Eisenhower Park, East Meadow, and is probably better known as a real estate tycoon. 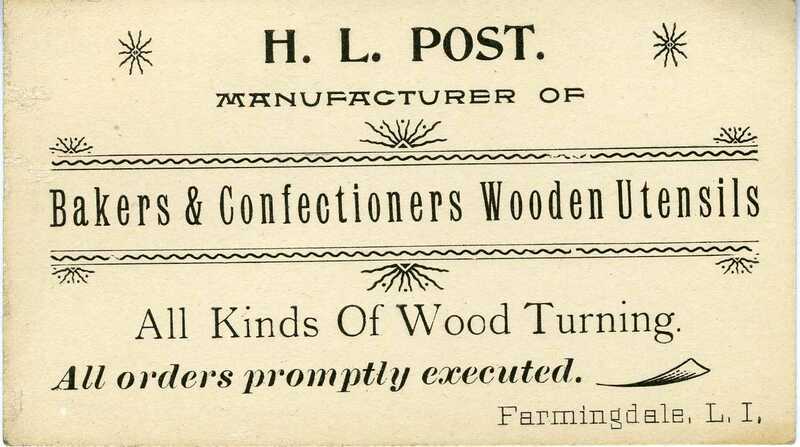 Obviously Post started out his woodturning business on a small scale, turning Bakers and Confectioners utensils, such as rolling pins and potato mashers. However an ad in the Southern N.Y. Vol. 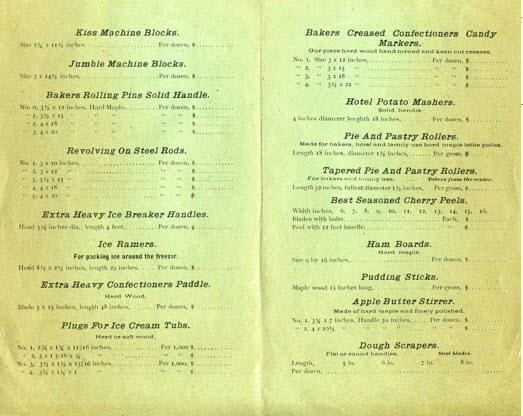 Firemen's Association’s 16th Annual Convention & Tournament held at Farmingdale on Oct. 3-5, 1911 show his growth with the variety of products that Post was now producing in his new modern Moulding and Planing Mill - Manuf. of Doors, Sash, Blinds, Store Fronts, Interiors, House Trim, etc. By 1918 he was producing the wooden bodies used in the Farmingdale built Fulton Motor Truck Co.’s vehicles – trucks which were sold nationwide and even used in the American Museum of Natural History sponsored Third Asiatic Expedition into the Gobi Desert of Western Mongolia in 1922. 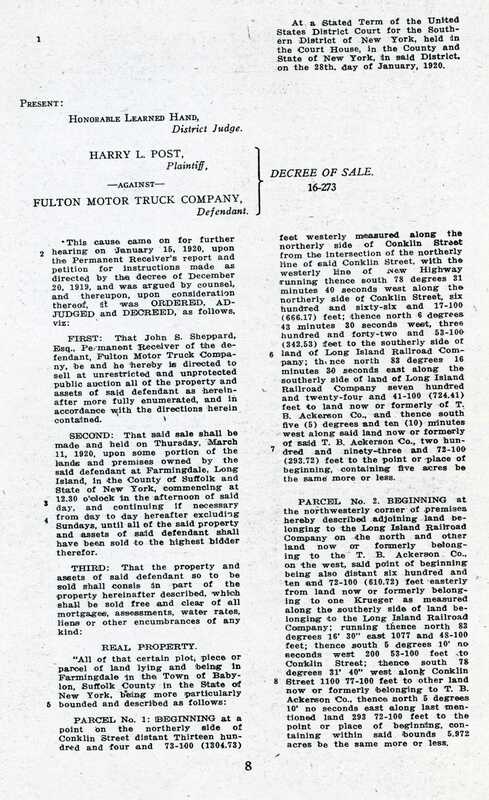 His association with the Fulton Truck started out well, but ended on a negative note – they owed him money for completed work, won’t (or couldn’t) pay him, which resulted in Post forcing Fulton to go bankrupt in 1920! Post’s letterhead shows the variety of work he was producing at this time “Commercial Bodies, Vans, Stake and Slat, Panel, Express, Cabs, Suburban Bodies for all Makes of Cars.” Harry’s brother Chester S. Post also worked for him. Obviously, Post met his future partner of Bell & Post at this time, while doing work for the Fulton Motor Truck Co. 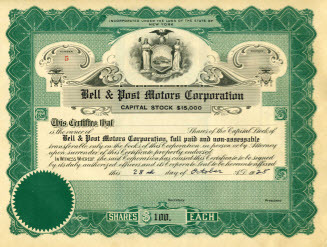 The Bell of Bell and Post refers to James L. Bell, who was in charge of factory production during the reorganization of the Fulton Motors Corporation in 1920. In September of 1924, with the resignation of Garvin Denby, J. L. Bell would become the President of the Fulton Motors Corporation, which never having regained support after its bankruptcy, pretty much was closing up operations. Other surviving photos from Bell & Post show the different style truck bodies they produced for non-Fulton vehicles. As indicated by the 1940 U.S. Census, Harry would later give up the truck body business (by that time wood bodies were a thing of the past) and go into his next woodworking business – boat building. At one time he worked for the Reliance Cruiser Corporation, located at City Island, N.Y. as Production Manager, apparently having gained his experience by first building a boat he named the Gladys, after his daughter, back around 1925. 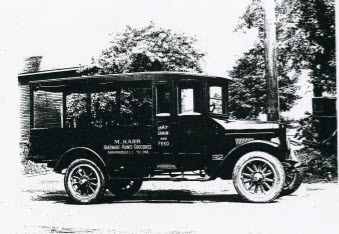 Both Harry L. Post and his wife Lottie are buried in the Powell Cemetery in Farmingdale, with Gladys’ ashes having been spread on top of their graves, thus ending the story of Harry Post’s woodworking career. I knew of Harry Post and his business back in the 1970’s when I first started researching the Fulton Motor Truck Co. Unfortunately, Gladys, after many years of taking care of her parents, became a recluse, rarely venturing out of her house. Fortunately through a mutual friend Gladys gave me the photo showing her Dad and Uncle at work inside the Mill, along with the letterhead. I would then meet two other historians, who would become my close friends, both interested in the Fulton Truck saga – the late Frank Spratt, and Al Velocci. Frank pursued the Fulton legacy eventually publishing his “The Remington’s and Clyde” [the Fulton Truck story] in 1988. He was always researching something, and had wanted to publish an article on Harry L. Post, something I don’t think he ever got to doing. Al took the Fulton story one large step forward by actually purchasing and restoring one of the three (?) existing Fulton trucks with his Dad and brother. This truck is now on display at the Cradle of Aviation Museum in Garden City, N.Y. The third person who originally helped me research the Fulton story was Henry Austin Clark Jr., who after receiving an unsolicited call from me invited me up to his house (that very day), where we poured through old periodicals in his basement and research files upstairs, and made piles of copies for me (at no charge), not to mention then treating me to lunch down in Locust Valley. What a treat! It seems hard to believe, but that was over 37 years ago. But the story didn’t end there – back in July of 1989, after Gladys death, her cousins held a “one dollar sale” where everything left in the family home cost $1.00 to buy! I just happened to be driving by, jammed on the brakes and started to build up a pile of “stuff”. Outside on the open porch was an old wooden barrel filled with “trash”, I only wanted the barrel, but was told I had to buy it with the trash inside. So I did – that’s where the good paper stuff was hiding – Harry’s business card and business flyer, old unopened mail and catalogs from the early 1900’s, etc. I actually had to have them hold my stuff so that I could run home to get some money to pay for my finds. Frank on the other hand, when he found out about Gladys death was able to track down the estate heirs and get copies of what little bit of Harry’s business records survived – some photos, the original stock certificate book, brochure, boat building photos & business card. That’s my story of Bell & Post! Very interesting reading. I went to high school in Farmingdale for a couple of years in the early fifties and I see that the then brand new Weldon E. Howitt H.S. that I attended was just a short distance from the Post house. Look who wrote the SDNY opinion, which was before he became the most famous Second Circuit judge and, eventually, the Supreme Court’s “tenth” justice. Learned Hand. Great history Gary, thank you. Terrific idea on LI auto makers, Howard. I don’t live too far from Springfield, MA, which legitimately can claim to be the birthplace of the American auto industry. The Duryea brothers started there, and then of course, there were the legendary Springfield Rolls Royces. A lot of our bodies could use some re-building. Cheers! The Cantrell family built woodie type bodies for over 40 years. Many of these cars were used on large estates on Long Island. After 1958 a son continued his father, Joseph’s interest in boats. Recently I read that much of their factory archives had been given to the local Historical Society. Also don’t forget Brewster who built many of the Sptingfield Rolls Royce bodies. Their last factory still stands. The assets of these 2 companies became part of Inskip Motors. 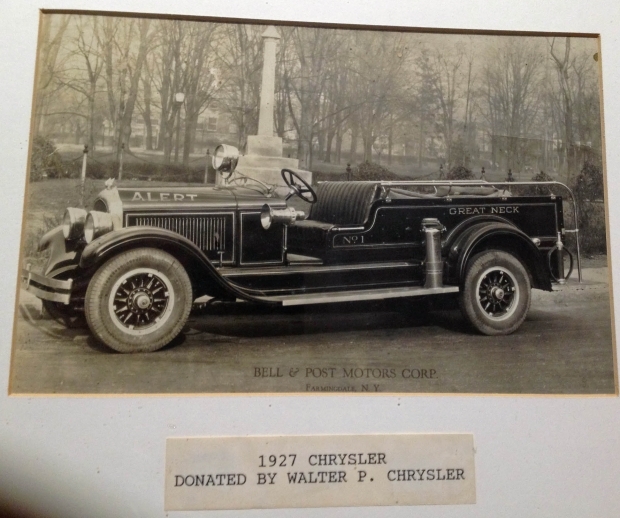 Many of the well to do familys on Long Island bought or had customized motor cars from them. The Springfield MA connection is rich in this period’s history. They have a large museum devoted to local manufacturing history including Indian Motorcycles. That’s so interesting that they used to use wooden bodies for these trucks. I guess I always assumed that cars were made of metal rather than wood, but in 1918 I suppose they were a lot different from now in many ways. I also didn’t know that the first international road race was on Long Island. The history of automobiles is so interesting!